Since my tweet has been liked and shared a lot, I thought I’d backup my claim with a small experiment. I’ve used my 6 year old Macbook Pro, so if you try this on your computer everything is probably faster! The problem I tried to solve was to implement a genetic algorithm initially programmed in python by Randy Olson. I’m participating in a Data Science Learning Club and the current activity was about Genetic Algorithms. The jupyter notebook by Randy was given as an example and we can always choose by ourselves how we want to approach a topic in the learning club. Since I’m currently not doing much in R, I decided it would be a good practice to stay up-to-date. Here is the complete code for the assignment in my git repo. There will be a lot more detail about the genetic algorithm code in a future blog post. Basically porting it was straight forward. I had to take care of the indices (R starts counting at 1, python at 0) and for me, Python’s indexing is not very intuitive. But I managed to create a running program. Randy’s settings were to use 5000 generations and 100 populations. His python code only took a couple of minutes on my computer. When I first wanted to run my R code I immediately noticed something was wrong. It needed approximately 7 seconds for one generation, which would result in a complete running time of 9 hours! I stopped the program and tried to investigate what was going on. This part accounted for more than 5 seconds of the 7 seconds per loop! So as a first step I changed the implementation of compute_fitness. This made it slightly better but only cut about half a second from the 5 seconds. Overall this would not reduce the running time by very much. Also notice the use of the method Reduce. While researching on how to improve my code, I also found out about Common Higher-Order Functions in Functional Programming Languages, which I didn't know existed in R (you might have heard about map/reduce operations before). That's very practical! Luckily I had the idea that maybe the data.frame where I stored the distances was the problem, since I had to do thousands of lookups. I researched a little and found out that matrices have better memory performance. Also the typical structure for storing pairwise distances is a distance matrix... I'm not sure if that's the whole story and what else is going on when I lookup something in a data.frame, but I thought it's worth a try. Since I use the city names as column and row names, I can directly use them to access the distance! And yay, I immediately noticed a huge speedup from 5.619 seconds to 0.042 seconds per generation, which is 133 times faster! My previous data structure, a data.frame of pairwise distances. 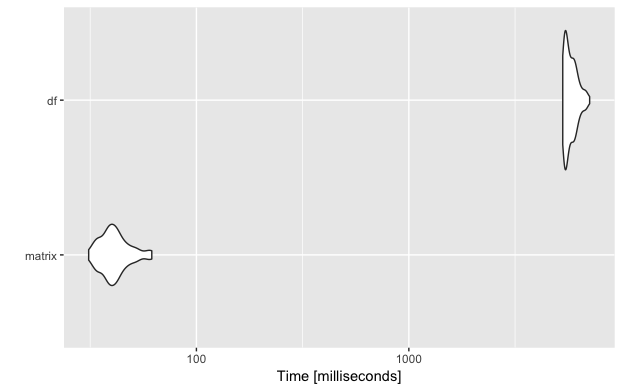 My new, faster data structure - a distance matrix. To do the comparison properly, I used the R package microbenchmark (link to documentation). You can pass one or more functions/expressions to the microbenchmark method and tell it how often to run the functions for the comparison. If you want to plot the results using autoplot it is important to give the functions names (e.g. matrix and df) otherwise it will try to put the whole expressions onto the y axis labels. And as you can see, just by replacing the data.frame by the more suitable matrix, this important part of my algorithm became a lot faster! I'd also like to know more about the underlying reason why there is such a huge distance. If you have any more resources, I'd like to read/hear about it! I made [a small gist](https://gist.github.com/privefl/968ca64d0175ad4afcc0ad1813b07013) where you can see that using matrices rather than lists and integers rather than characters can further improve the performances of your algorithm. PS: you should check your `shuffle_mutation` function. Pretty cool, I’ll try it out! What do you mean about the shuffle_mutation? correctness or performance? I’m aware that it’s not yet performant, do you have any suggestions? There are some indices at 0 in `shuffle_mutation`. Maybe the port from Python? From the performance point of view, `shuffle mutation` is taking half of the time of the whole algorithm, so it would be worth optimizing it if you care about performance. Thanks, but the 0’s in shuffle_mutation are on purpose. So if the variable is 0, 0:variable returns an empty array. If I had used 1:variable, it returns an array [1 0] and the indeces are wrong. I guess I could use seq_len or seq_along but I didn’t care too much about that. Previous Previous post: Wasserkefir – so geht’s!